Discussion in 'News' started by TC News, Mar 22, 2019. Discuss Badge of Honour in the News area at TalkCeltic.net. That emblem disappeared from the jersey the following year. It was replaced for a time in the 1890s with a golden harp against a blue background, a traditional Symbol of Ireland (check out Ireland's latest Euro 2022 Qualification odds at sk-bonus.com), which was also used in advertising matches at Parkhead in the latter part of the nineteenth century. Over recent years the four leaf clover, a good luck charm dating back to Pagan times, has come to be associated with Celtic. It’s not clear how and when this was first used, but it’s thought it may have been taken from a plaque designed by an early supporters club; something which reminded the board members of the rich green sod which had been brought over from Donegal and placed in the centre circle in 1892. What we can say for certain is that it was inscribed onto medals presented to players back in 1908. These marked their achievements in Winning a clean sweep of trophies that season: Scottish league championship, Scottish Cup, Glasgow cup and the charity cup. Four leaves were required, since one trophy was mentioned on each. The clover was also used officially at dinners and on memorabilia during the 1920s and 30s, though never making it as far as the shirt. 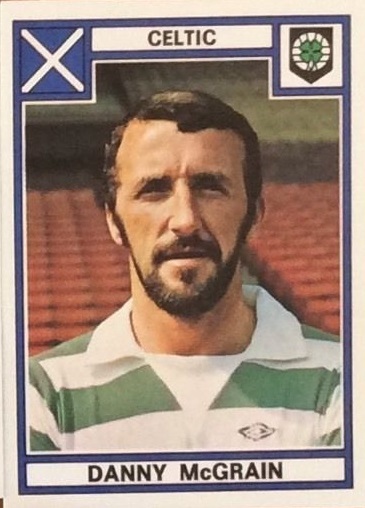 However a large green three leaf version, more commonly thought of as a shamrock, appeared on the teams away kit at various times from the 1920s to the mid 1960s. In 1976/77 the double diamond logo of the sports manufacturer Umbro was added. Then a year later for the first time ever, the four leaf clover adorned the hoops. The vast majority of major clubs had gone down the route of displaying the badge on their kit. 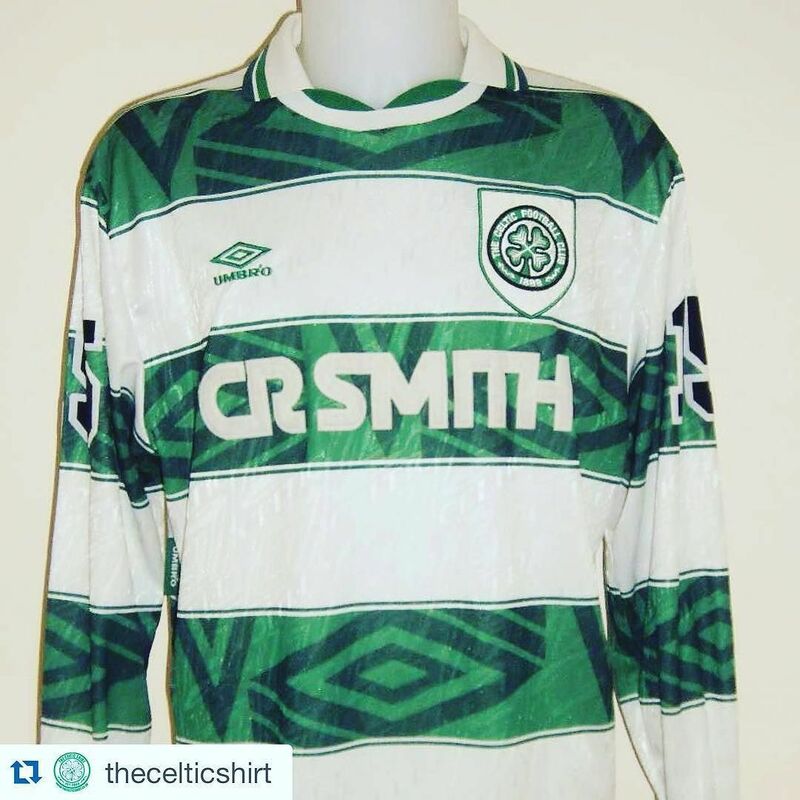 This was Celtic’s effort to do the same; an act of modernising which created a design classic at the same time. The badge was altered considerably in time for the Centenary season 1987/88. 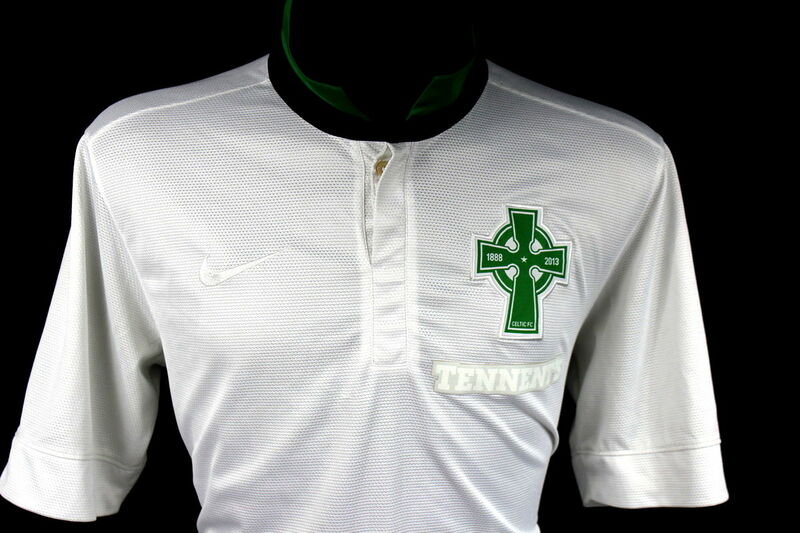 The then chairman, Jack McGinn, reinstated the motif which had been used on the first strip, the Celtic Cross. McGinn had tried and failed to discover why it had originally been chosen, but understood its importance nevertheless, since Wiley Maley - the Bhoys legendary first manager - had written a book about the club which featured the same design on its cover. With a glorious league and cup double won during the Centenary celebrations, the crest proved to be highly popular with the supporters and was even used in eye - catching style in a large scale floral design at the Glasgow Garden Festival. 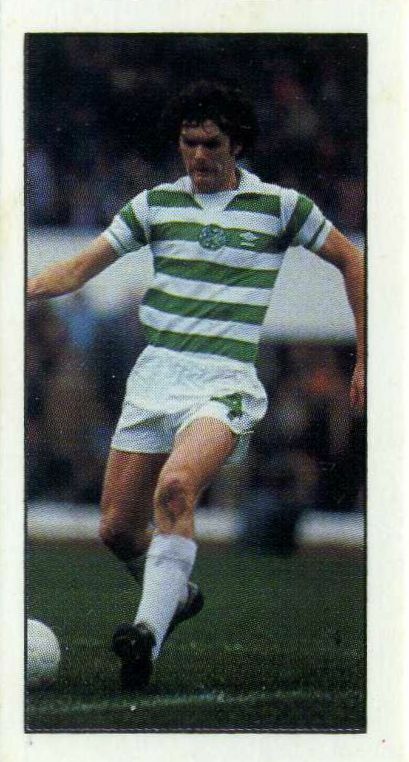 By the time the next kit was issued, for the 89/90 season the now traditional clover had returned. The emblem would not be altered again until 1995 when, having become a public rather than a private limited company, the words on the badge were changed from The Celtic Football And Athletic Co. Ltd to read simply The Celtic Football Club. Suggestions from inside Parkhead at this time, that the clover motif should be dropped so that “some sort of Scottish element could be incorporated,” eventually came to nothing. This was probably because such a move would have been met with considerable opposition from season ticket holders. Then between 1993 and 1997, the crest was displayed in the middle of a large white shield - though there was no fiddling with the badge itself. Excerpt from a 2010 book by Douglas Beattie. The Pocket Book of Celtic. Pictures selected at random and from Celtic Wiki. Since this written piece we have included a few more changes. One is the White third strip from season 2012/13, a celebration of 125 years of unbroken football and success. It was a smart shirt and became a bestseller and fans favourite. This shirt was about Celtic as a club and the kit makers Nike and sponsor Tennants both agreeing to white logos to blend into the background. On the left breast a strong green Celtic Cross with the writing 1888 - 2013 Celtic F.C. A nice black fold over collar with emerald green underneath. A shirt that will cost you £50-60 pre-owned at this moment. Leading us on to the present moment in which our away shirt is a representation for 130 years of unbroken and successful football. 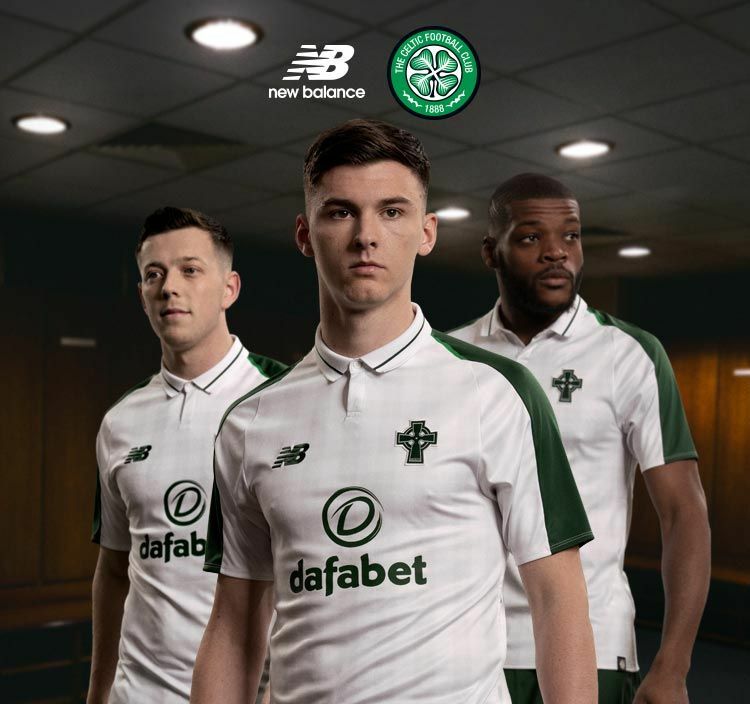 The New Balance shirt once again displays the Green Celtic Cross on the left breast. Much similar to 2013 badge but without the dates but the one white star is retained. It’s a great design that NB got entirely right. To find the latest odds on Celtic's upcoming fixtures, visit the bet365 alternatív link.